Written by locals, Fodor's travel guides have been offering expert advice for all tastes and budgets for 80 years. Montr al and Qu bec City are treasured destinations for American travelers: a corner of France in North America. This guide, with rich color photographs throughout, captures the French-speaking cities' universal appeal, from sidewalk caf's to winter sports and traditional French cuisine. 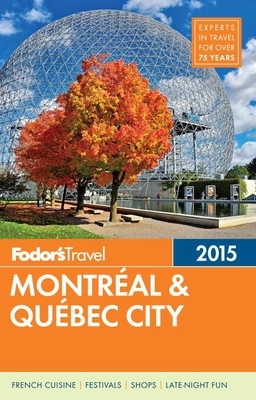 This travel guide includes: - Dozens of full-color maps plus a handy pullout map with essential information - Hundreds of hotel and restaurant recommendations, with Fodor's Choice designating our top picks - Multiple itineraries to explore the top attractions and what's off the beaten path - Major sights such as Basilique Notre-Dame-de-Montreal, Parc du Mont-Royal, Mont-Tremblant, Musee des Beaux-Arts de Montreal, La Citadelle, Fairmont le Chateau Frontenac, Tadoussac, and Plains of Abraham - Side Trips from Montreal including The Laurentians, The Outaouais, and The Eastern Townships - Side Trips from Quebec City including Cote-de-Beaupre, Ile d'Orleans, and Charlevoix - Coverage of Montreal and Quebec City.